Arnold Schwarzenegger chest and back workout: Ready… Superset…Go! After all of the box-office successes (and failures), all of the State of the State speeches and ballot initiatives, all of the fame and fortune, it’s easy to forget that at his very core Arnold Schwarzenegger is, first and foremost, a gym rat. Long before he ever uttered a one-liner or sparred with a hostile legislature, the five-time Mr. Universe and seventime Mr. Olympia spent untold hours toiling away in shoebox-size gyms across the globe, pushing, pulling, and pumping iron. The aim of his efforts was to become the best bodybuilder on the planet, and it was a goal he achieved year after competitive year throughout the 1960s and ’70s. Ever the student, Arnold continually honed his skills, applying the same rigorous discipline to his gym work as he later would to his film and political careers. Just as important, he was fearless (another common Schwarzenegger theme) in his training.While many of his bodybuilding peers were content to follow the staid dictums that had been laid out decades earlier with blind obedience, Arnold always looked for ways to up the intensity. 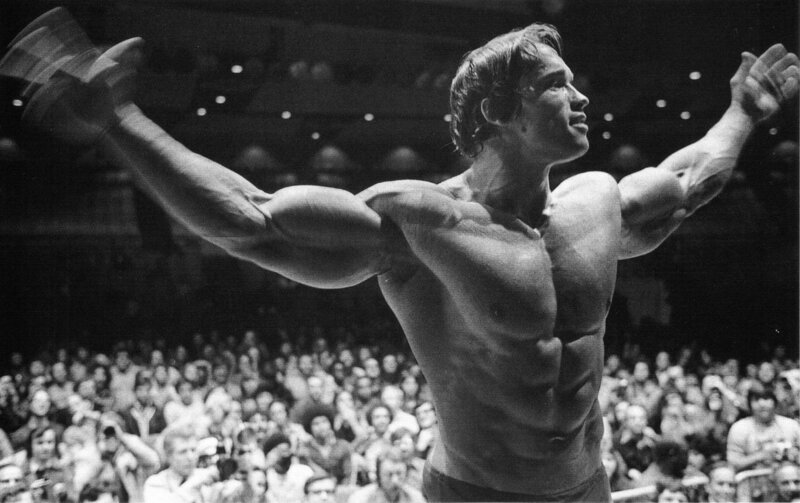 When it comes to chest and back training, Arnold’s philosophy could be described as ‘pair and pair alike.’ It worked. During the early to mid-1960s, at the start of his competitive career, he followed a rudimentary training plan that had been designed for him by the elder bodybuilders at the gym in Austria where he first trained. The routine was basic and sound enough, but not the kind that would turn a small-town Austrian kid into a world-class success. As his own development surpassed that of his mentors, Arnold realized that without finding ways to increase the intensity of his workouts he’d probably end his career being known only for having won the Mr. Europe title. “One of the most important reasons why a chestback superset program works so well is the fact that most chest exercises are pushing movements, while all back exercises are pulling exercises. The chest muscles are resting during the lats exercise and the lats are resting during the chest movement. While each muscle is alternately resting and working, it stays fully flushed and pumped up…. When the chest and upper back are pumped simultaneously, there is an indescribable feeling of growth stimulation and massiveness.” – Arnold Schwarzenegger. Supersetting involves the grouping of two or more exercises performed in sequence without rest. There are two ways of supersetting: one that groups exercises for the same body part, and another that pairs exercises for opposing body parts. Arnold was a fan of both variations, and he applied supersetting most faithfully to his chest-back workout. Nowadays, few bodybuilders perform double-split routines, believing that two workouts per day will overtax the body. It didn’t seem to do Arnold any harm, though, and the double split wound up being de rigueur for most of the pros who trained at Gold’s Gym in Venice, CA, during its halcyon days of the 1970s. Arnold’s cset/back routine consists of nine exercises-four for chest and four for back, followed by dumbbell pullovers, which is a combination exercise that works the lats while stretching the pecs. In total it’s 45 working sets done with no rest during the supersets and only a minute or so between supersets, after which he would spend a few minutes forcefully flexing the muscle groups he had just trained. From start to finish the workout takes about 45 minutes, and by the end of it the Austrian Oak would be drenched in sweat and gasping for air. Legend has it that Gold’s Gym would keep an oxygen tank on hand to assist Arnold and his training partners in making it through such physically taxing workouts. Clearly, the effort wasn’t wasted; Arnold’s chest would eventually stretch the tape to an improbable 57 inches, due in large part to pecs and a back that still rank among the best in bodybuilding history. While following Arnold’s chest-back routine may not give you a jacket size greater than the average woman’s height, it should prove a grueling but effective way to add quality mass to your torso. The first superset of the routine would begin with a warmup of 30-45 reps on the bench with 135 pounds, followed by 15 chins. For the next five sets, Arnold would shuttle back and forth between bench presses and chins, pyramiding up in weight for the bench press while reducing reps for both the bench and chin. Typically, his rep scheme would be 15, 15, 12, 8, 6 for each exercise. It’s worth noting that Arnold was diligent about his breathing and made sure to take extra deep breaths during this particular superset. Typically, you’ll see guys bring the dumbbells about as low as their chests and then clank them together at the top of the movement. Arnold’s form was nearly the opposite – he made it a point to bring his elbows down as far as possible, with the dumbbells around bench level. As he brought them back up in a perfect arc, he’d stop when they were about a foot apart – just at the point when tension on his pecs was lessening. Similarly, for barbell rows he’d stand on a bench or high box-the better to get a full stretch at the bottom-and, with his torso nearly parallel to the floor, perform picture-perfect reps. No jerking the weight for him; it was all back taking the load. By this point Arnold would be sucking wind pretty good. He’d have been at it for more than a half hour, and the dual pump in his pecs and lats would be stretching his tank top. He’d strap a dumbbell weighing as much as 80 pounds around his waist and aim for 15 reps in each of the five sets of dips. For the close-grip chins, he preferred using a V-bar attachment that he’d drape over the overhead bar. If none were to be found, he’d take a narrow, overhand grip and shoot for five sets of 12 reps. Despite his state of near-total fatigue, he’d knock out five sets of 15-20 full, breathing- intensive reps to finish the workout. Finally, after 45 minutes and a few pounds of lost sweat, Arnold’s morning workout was done. “As I head for the shower, I feel exhausted but exhilarated, like a boxer who has just gone 15 rounds with the heavyweight champion and beaten him with a knockout in the final round!